Feel better, all-round. Meditation, Recreation, Floor Exercises, soothing rest and recuperation are some of the ways to benefit from the famous Infrared Tourmaline Mat. Its reputation is great in Korea, Japan, and other Asian countries, and amongst users of alternative health techniques in the West. The tourmaline mat is a complex, technologically advanced multi-layered mattress, with circuits to radiate Infrared heat through actual tourmaline. Offers well-being and serenity even in our hectic times, by combining the time-honored floor culture of ancient Asian villages with the luxury leisure culture of modern living spaces. The result of intensive research, the mat combines the therapeutic value of highly efficient Far Infrared Radiation with natural ionizing function and a system to neutralize harmful electromagnetic waves. The Tourmaline Heating Mat is a truly well-made product, a far cry from the harsh heating coils of electric blankets. Multiple layers of ingenious design, to disperse gentle heat through the minerals, neutralizing e-waves, offering natural ionizing function as well. No harmful waves of any kind are emitted by the Tourmaline Mat. The Tourmaline is inset with disks of natural tourmaline gemstones. When the tourmaline stone is heated, it emits infrared rays that penetrate the body 14-15cm (5.5 to 6 inches). The rays not only benefit the muscles on the surface of the body but deeper parts of our body. These rays soothe, alleviating backache and other pains such as arthritis pain. Tourmaline has a unique crystal structure and is unique among minerals in showing pyroelectricity, which means that when crystals are heated they produce a positive charge at one end of the crystal and a negative charge at the other. • High blood pressure can be lowered by relaxation, de-stressing, natural effects of tourmaline. Tourmaline is actually a group name for several different, but closely related minerals. Members of the Tourmaline Group are favorites among mineral collectors. Their rich and varied colors captivate the eye. Even black or brown opaque tourmalines shine nicely and produce sharp crystal forms. Tourmaline is a precious stone, whose colors include blue, green, pink, red, yellow, brown, black, bi-colored, tri-colored, and colorless. Tourmaline may be found in Brazil, Russia, Burma, Afghanistan, Madagascar, Maine, California. Tourmalines have many unique mineral properties. Among these, they are piezoelectric which means that when a crystal is heated or compressed (or vibrated) a different electrical charge will form at opposite ends of the crystal (an electrical potential). Conversely if an electrical potential is applied to the crystal, it will vibrate. Also they are pleochroic which means that the crystal will look darker in color when viewed down the long axis of the crystal than when viewed from the side. They also show pyroelectricity, which occurs when the crystal is heated, yielding a positive charge at one end of the crystal and a negative charge at the other. Because of this, some call Tourmaline "electric stone," with its own internal electrodes. In being heated, tourmalines are both ionized and radiant of Far Infrared Radiation (transmitting heat). According to New Age and alternative health practitioners, Brown Tourmaline (Dravide) is an excellent grounding stone, clearing and opening the earth chakra and the grounding cord holding the physical body in incarnation. It clears the aura, aligns the etheric body and protects it. Encouraging community spirit and social commitment, Brown Tourmaline makes one feel comfortable in a large group. This stone heals dysfunctional family relationships and strengthens empathy. In this system of thought, Brown Tourmaline is pragmatic and promotes creativity. In healing, it is thought to ameliorate intestinal disorders and skin diseases, and stimulate regeneration in the whole body. For more information on Tourmaline click here. HOW TO IMPROVE CHI FLOW With the Chi Energizer? 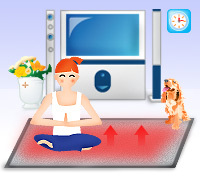 Use our Chi Machines and the Tourmaline Heating Mat together. 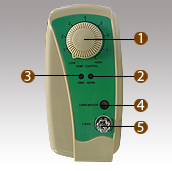 For balancing and connecting the Chi, according to the theory of Traditional Chinese Medicine. They clear the aura, remove blockages, disperse negative energy, and point to solutions for specific problems. Dimensions 45.5 cm x 45.5 cm / 17.5" x 17.5"
Assembly 30 Sec. ~ 1 Min. The Tourmaline Heating Mat is not a medical product.